In her latest book “Found in Translation” S. C. Scott gives writers and translators a lot of insight into the actual literary translation scene. The book and translation industry has changed, forced into embracing the digital revolution, just like a lot of other industries. 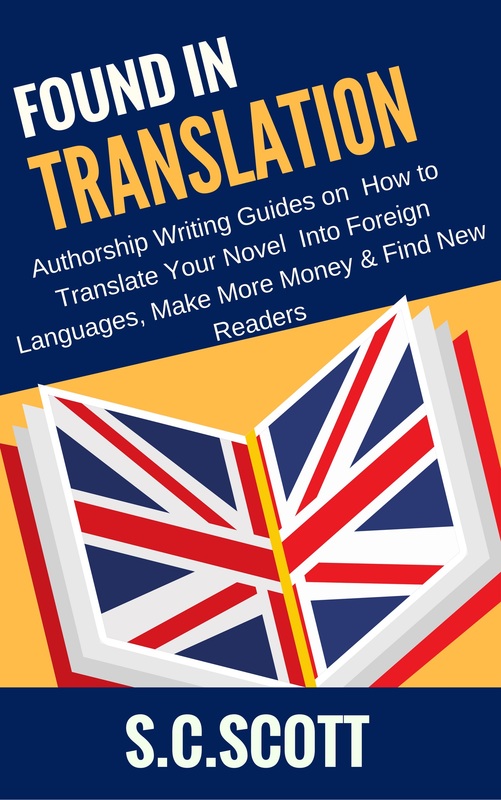 The book takes up the topic on translations within the Indie Publishing market and gives authors advice on how to navigate through this fast-growing industry that is filled with new opportunities. You published nine books in two different series under your pen name. Would you describe yourself as an Indie author? S.C. Scott: Yes. After one traditionally published novel I switched gears and have never looked back. Being an Indie author gives me flexibility and greater control over my work. For instance, I can put my books on sale or offer special content to my reader subscriber list without having to get publisher approval. I can choose my own covers, and change things up if they are not working. All this also means more work but I love what I do and wouldn’t change a thing. It’s a great time to be an author because we have so many opportunities available to us through technology. You wrote mysteries and thrillers. This is your first Non-Fiction book. How did it come about? S.C. Scott: When I first looked at literary translation, there wasn’t much information for authors. Most authors just sold their foreign language rights to publishers for very little money. After I completed my first translation so many authors asked me questions that it just seemed logical to write a few notes for them. The book sort of wrote itself after that. I’ve had a lot of positive feedback from authors which has been great. When did you make the decision to go one step further and get your books translated? S.C. Scott: I noticed that I was selling my English language books in France, Germany, and other countries. I had never even considered that my books would sell outside of English-speaking countries, yet they were. I knew of a few other authors who had explored translations so I decided to investigate further. It has opened up a whole new world of readers for me. In how many languages have your books been translated so far? What is your strategy when it comes to selecting foreign markets? S.C. Scott: My books have been translated into eight languages to date. I consider genre, market size, and ebook market maturity when evaluating a language. Some genres are less or more popular in particular languages. I wait until ebook adoption is at least above 10% in a particular country because most of my sales are ebooks. I want to be sure that there is enough of a reader base to make it worthwhile. I also consider pricing. For instance, China is a huge market but books sell at about one-fifth of the price they do in Europe. Some markets are very small, but you can price higher. This all factors in to whether translation of a book is practical from a dollars and cents perspective. The translation of a book is a long-term commitment for both parties. What is your personal approach when it comes to finding the right translator? S.C. Scott: I look for translators who share similar interests or expertise in my subject matter. It helps if the translator has a good bio detailing relevant education, experience, and they types of books they like to translate. A few back and forth questions tells each of us whether we are a good match or not. Designing a contract that is fair for both parties isn’t the easiest task. There are a bunch of model contracts available. Some include an advance payment plus royalty, others offer a fixed price per word whereas some are royalty based only. What are the pros and cons of the different payment options? S.C. Scott: A straight royalty has the most uncertainty for both the author and translator. But it also has the most upside in terms of profit. Many translators looking to branch into literary translation will do a royalty share in order to gain experience. It can also pay off very well if you end up with a bestseller. How well a book sells is in part due to the original book, but an excellent translation can sometimes be even better than the original book. So, how do you end up with a bestseller? Translate many books, and choose your projects carefully. I have also paid a fixed price per word. The advantage of this option is simplicity in terms of bookkeeping, and financial certainty for both parties. The uncertainty from an author’s perspective is that you are paying up front for a product that is ultimately evaluated by readers in their reviews. If the translation isn’t great and is reflected in bad reviews, you have little or no recourse. I have done a flat fee plus a percent royalty, though I prefer not to, due to the ongoing payments and bookkeeping, which be time-consuming when you sell worldwide at many stores. Calculating royalties can quickly get out of hand if you have many translated works in different languages. Thanks Petra. I appreciate you inviting me to your blog.